SPRINGFIELD, IL – The results of the 2018-19 Illinois Bobcat Hunting and Trapping permit lottery are now available online through the Illinois Department of Natural Resources (IDNR) website. 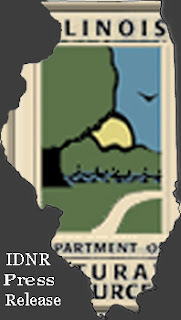 Applicants can check the status of their application at https://www.dnr.illinois.gov/hunting/furbearer/Pages/BobcatPermitLookup.aspx. More than 5,000 hunters/trappers applied for bobcat permits, and 1,000 permits will be issued. SPRINGFIELD, IL – Hunters and trappers in Illinois harvested a preliminary total of 318 bobcats during the 2017-18 Illinois Bobcat Hunting and Trapping Season, the Illinois Department of Natural Resources (IDNR) announced today. Permit holders salvaged another 40 roadkill bobcats during the season. The 2017-18 Illinois bobcat season was open from Nov. 10, 2017 until Feb. 15, 2018, and 1,000 permits were issued to hunters and trappers for the season. On September 22, 2017 Governor Rauner signed HB 3399 which will allow hunters and trappers to harvest up to 350 bobcats during the 2017 - 2018 season. 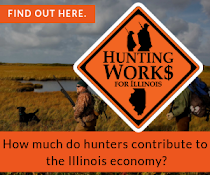 However, if you hunt/trap in these counties (Boone, Bureau, Champaign, Cook, DeKalb, DeWitt, DuPage, Ford, Grundy, Henry, Iroquois, Kane, Kankakee, Kendall, Knox, Lake, LaSalle, Lee, Livingston, Logan, Marshall, McHenry, McLean, Ogle, Peoria, Piatt, Putnam, Stark, Stephenson, Vermilion, Will, Winnebago, Woodford) the law makes it unlawful to do so for bobcats. 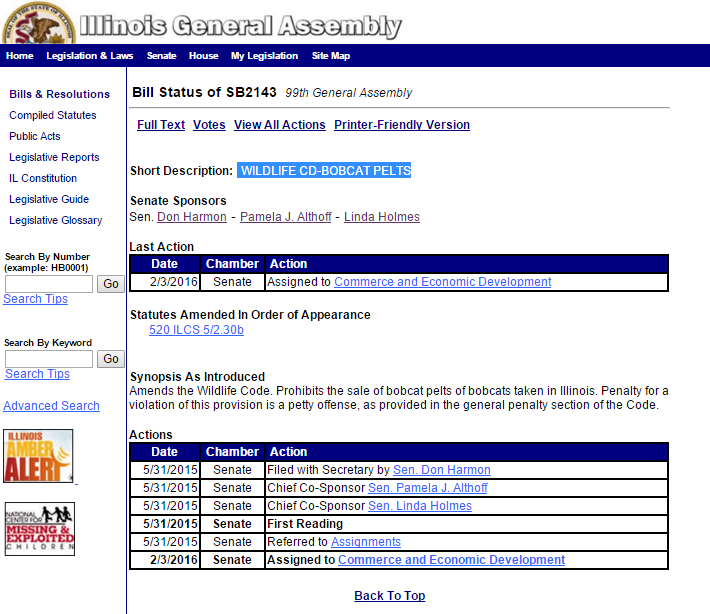 This is one of the last bills we've been waiting action on from the governor. SPRINGFIELD, IL – A new state law will allow hunters and trappers to harvest up to 350 bobcats during the 2017-18 Illinois Bobcat Hunting and Trapping Season which opens on Nov. 10. The legislation making changes in the bobcat season, House Bill 3399, was signed into law on Sept. 22. Additionally, the new law also changed the list of counties in which it is unlawful to hunt or trap bobcats in the state. The following counties are prohibited from hunting or trapping bobcats: Boone, Bureau, Champaign, Cook, DeKalb, DeWitt, DuPage, Ford, Grundy, Henry, Iroquois, Kane, Kankakee, Kendall, Knox, Lake, LaSalle, Lee, Livingston, Logan, Marshall, McHenry, McLean, Ogle, Peoria, Piatt, Putnam, Stark, Stephenson, Vermilion, Will, Winnebago, Woodford, and the area north of U.S. Route 36 in Edgar and Douglas counties and north of U.S. Route 36 to the junction with Illinois Route 121 and north or east of Illinois Route 121 in Macon County. Bobcat hunting and trapping season dates are Nov. 10, 2017 through Feb. 15, 2018. Illinois resumed bobcat hunting and trapping during the 2016-17 season. During the 2016-17 season, the taking of bobcats was prohibited in a northeast quadrant of the state bounded by Interstate 39/U.S. Route 51 on the west and U.S. Route 36 on the south, and was allowed in the remainder of the state. Hunters and trappers may apply for 2017-18 bobcat permits through Sept. 30. A total of 1,000 permits have been allocated, and a lottery drawing will be conducted as more than 1,000 permit applications have been received. During last year’s bobcat season, Illinois issued 500 permits and hunters and trappers harvested 141 bobcats, a 28 percent success rate. CHANDLERVILLE, IL – A public drawing for the allocation of trapping permits at Jim Edgar Panther Creek State Fish and Wildlife Area will be held at Saturday, Oct. 7 at 1:30 p.m. Registration will begin at 1:00 p.m. at the site headquarters, located approximately five miles southeast of Chandlerville. One permit for each of the five trapping zones will be allocated through a lottery drawing. All persons attempting to enter the drawing must be in attendance and have a current 2017 trapping license in their possession. DP (Dog Proof) Traps, live traps, and traps of similar action may be used. Homemade dog-proof traps must be designed with a foothold trap no larger than a #2 in an enclosed wood, metal, or durable plastic container with a single access opening of no larger than 1½ inches in diameter. All body-gripping traps must be totally submerged. 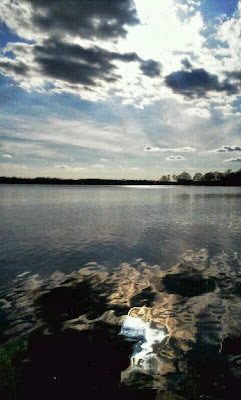 ROCHESTER, IL – A public drawing for the allocation of Sangchris Lake State Park trapping permits will be held at 1:00 p.m., Saturday, Oct. 14. 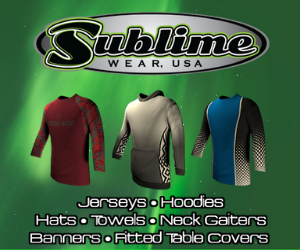 Registration will begin at 12:30 p.m. at the site headquarters, located approximately six miles southeast of Rochester. One permit for two trapping zones will be allocated through the drawing procedure (the Sangchris subimpoundment area will now be included as another zone open to trapping). Two names will be allowed on the permit, and only those individuals listed will be allowed to trap. All persons entering the drawing must have a current 2017 trapping license in possession. Persons whose names are drawn must be in attendance. Starting February 1, 2018 until the end of the trapping season on March 31, 2018, Sangchris Lake State Park will open to statewide regulations, meaning that any individual with a valid 2017 trapping permit who is interested in trapping can do so (beaver, muskrat, and river otter only). Amends the Wildlife Code. Provides that it shall be unlawful for any person to trap bobcat in this State at any time. Provides that no person shall knowingly sell, offer for sale, or purchase a bobcat pelt of a bobcat taken in this State. Makes conforming changes. Effective immediately. Hearings: None Scheduled at this time. The Illinois Trappers Association (ITA) will hold two fur auctions in January. 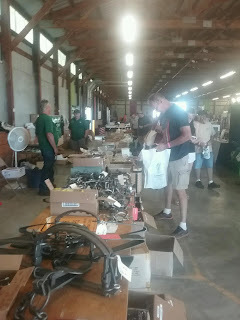 The first will be the Northern sale at the Odell Community Center, 408 North Morgan St., Odell, Illinois, on Saturday January 14th. Doors open at 6:00 am and the action starts at 9:00 am. 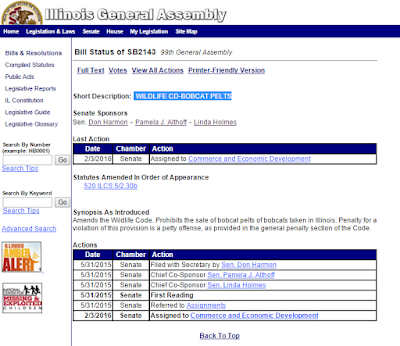 On February 11, 2016 Representative Avery Bourne (Republican, Litchfield, Illinois) introduced HB 5962. Amends the Wildlife Code. Provides that a resident youth 18 and under may apply to the Department of Natural Resources for a Youth Trapping License, which extends limited trapping privileges. 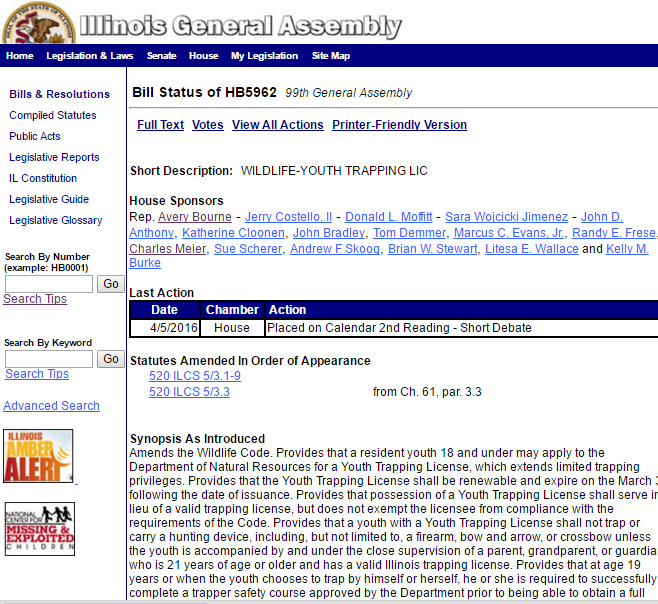 Provides that the Youth Trapping License shall be renewable and expire on the March 31 following the date of issuance. Provides that possession of a Youth Trapping License shall serve in lieu of a valid trapping license, but does not exempt the licensee from compliance with the requirements of the Code. 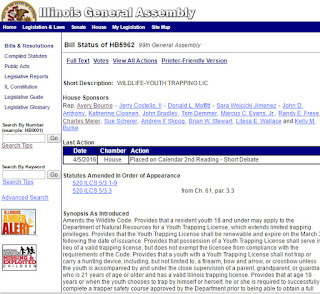 Provides that a youth with a Youth Trapping License shall not trap or carry a hunting device, including, but not limited to, a firearm, bow and arrow, or crossbow unless the youth is accompanied by and under the close supervision of a parent, grandparent, or guardian who is 21 years of age or older and has a valid Illinois trapping license. 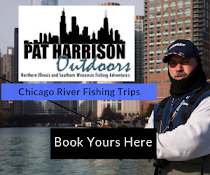 Sponsored by Senator Don Harmon (Democrat of Oak Park, Illinois) Senate Bill 2143 (WILDLIFE CD-BOBCAT PELTS) was introduced back in May of 2015 and has been silent since. That was until February 3, 2016 where SB 2143 has been assigned to Commerce and Economic Development. 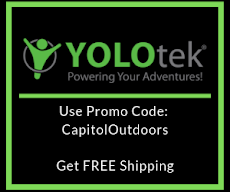 Continue to check back with Capitol Outdoors as we monitor this and other bills for you. Amends the Wildlife Code. Prohibits the sale of bobcat pelts of bobcats taken in Illinois. Penalty for a violation of this provision is a petty offense, as provided in the general penalty section of the Code. Below is a press releases from the Illinois Department of Natural Resources regarding the harvesting of bobcats in Illinois. The Bobcat Bill was approved by Governor Rauner on July 15, 2015. Read about the Illinois Bobcat Hunting Bill Clears House Hurdle history. 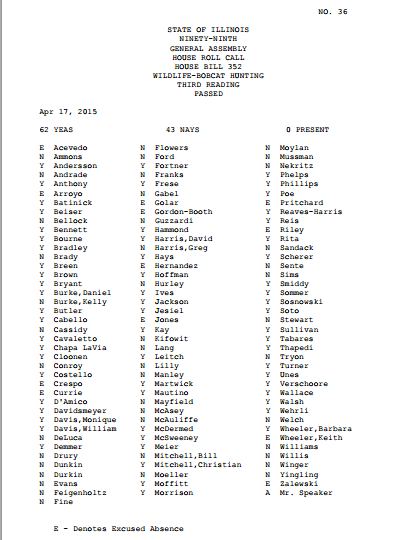 Above is the roll call vote for HB 352. Today House Bill (HB) 352 "Bobcat Hunting Bill" cleared another hurdle. It passed 62 to 43. You may recall that a similar bill passed both the house and senate last year during the 98th general assembly. Governor Pat Quinn veto that bill on January 11, 2015. HB 352 creates a Bobcat Hunting season to be regulated by the IDNR. A maximum of 500 permits will be issued each season for $5 a permit. 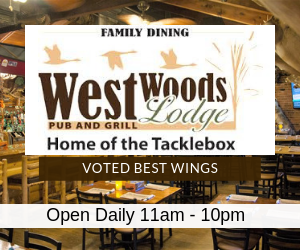 This $5 dollar fee will add up to $2500 to the Wildlife and Fishing Fund. You can read the HB 352 and SB 106 in its entirety.